From the monumental glaciers of the Chilean Fjords to the ice-covered wonders of Antarctica, this incredible journey will leave you in awe of Mother Nature. Welcome to Lima, Peru where your journey into wonder begins with a warm greeting by the crew as you step on board Scenic Eclipse. Paracas Bay, on the Pacific coastline of Peru is where the desert and the sea come together in spectacular landscapes. Witness a private Peruvian music performance as the sun sets. Relax and enjoy the facilities of your floating resort. Explore the colourful historic centre or travel to the Casablanca Valley and taste some of Chile’s finest vintages. Join a presentation by the Discovery Team. Discover the German heritage of Frutillar. Alternatively visit Osorno Volcano and Petrohué Falls or choose Senda Nativa Romahue Reserve. Discover the World Heritage-listed churches and architecture of Castro or take a hiking tour into the National Park. Discovery: Scenic Discovery excursions by kayak or hiking. Your senses will be overloaded with the majestic scenery and wildlife of the inner passages of the Chilean Channels. Discovery: Scenic Discovery excursions by kayak or Zodiac. Lying in the Magellan Strait, this small island is a national monument of Chile and breeding location for many species of birds including the Magellanic Penguin. Discovery: Scenic Discovery excursions by Zodiac and kayak will highlight the different species and walking tours led by passionate local guides sharing their insights. Sensory days of cruising await. 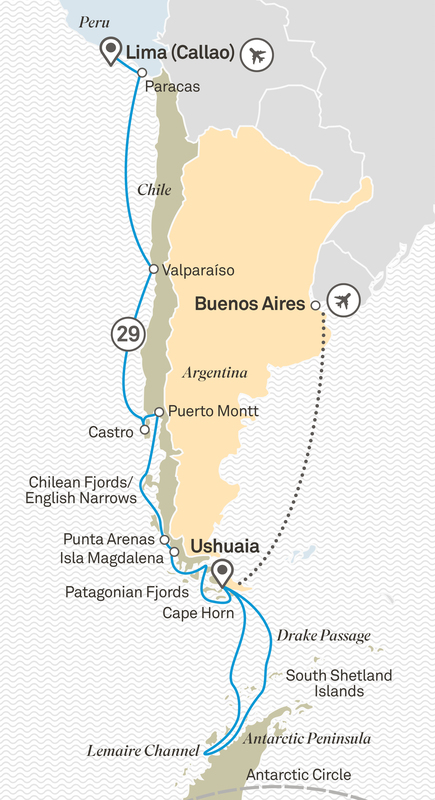 The point where the Atlantic and Pacific Ocean meet, Cape Horn, steeped in maritime history, is the southernmost headland of the Tierra del Fuego archipelago and at the southernmost tip of Chile. Explore this unique town, the southernmost in the world. Discover the Tierra del Fuego National Park or explore the inland lakes of the peninsula. Set sail this evening and cruise through the Beagle Channel and admire the dramatic views of the Andean mountains of Tierra del Fuego from the comfort of your private verandah.